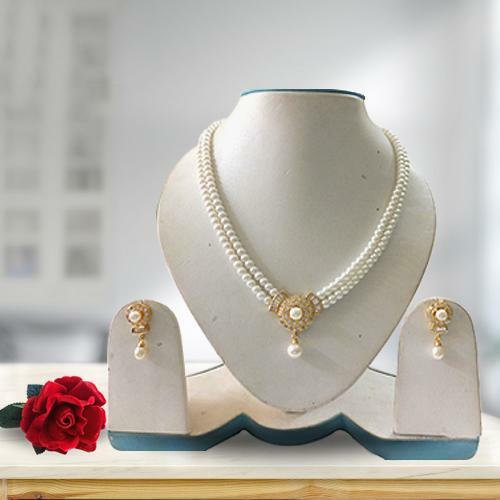 Bring the feeling of happiness by sending this Gaudy Double Chain Pearl Set into the life of your most special person. Its a single drop pendant with two earrings is the awesome way to create yourself magical. Flowers Delivery Ooty, Send sweets Kolhapur, Wedding Cake Bhilai, Diwali Mithai Bhopal, Send Flowers and Gifts to Bhiwadi, Online Shop Bombay, Flower to Belgaum, New Year Flowers Latur , Fresh Fruits Rajamundry, Send Gift Gurgaon, Dry Fruits to Pune, Birthday Delivery Raipur, Sending to Pali, Flower shop Bilaspur, Sawai Madhopur Online Cake Delivery.